A full color softball soars on 3 shooting stars on this fun Tri Star Resin. Personalized for your event this trophy is the perfect budget friendly recognition of excellence on the softball field. The softball batter at the top of this trophy stands on a 5" riser that features a 3 dimensional softball framed on 2 sides by clusters of stars. Mounted on a round black plastic weighted base that has plenty of room to personalize, this trophy is sure to be a hit with the star players on your team. Kids are going to LOVE this unique softball award that's actually 2 awards in one! The resin features a bronze textured "V" as the backdrop, embellished with a gold star, and full color softball, bat and glove. The "V" sits atop a base that has ample room to personalize for your event. Around the top of the base is the bonus award, a black and yellow softball wrist band that can be taken off and worn! This award is double the fun with one to display on their shelf, and one to wear on their wrist! 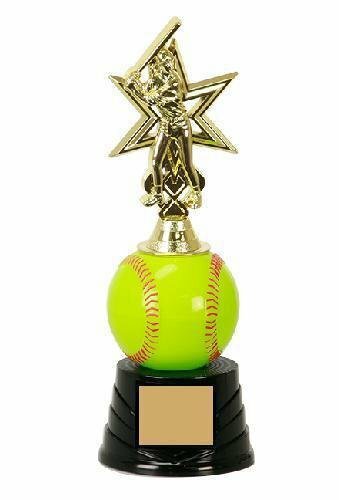 This modern trophy features a 5-1/4" female softball player waiting for that perfect pitch. She is backed by a large gold open star, and sits on a full color 3" replica of a softball. The black sculpted plastic base adds dimension and height to the trophy, and has plenty of room to personalize for your event. This is a perfect trophy to recognize the stars on your team. An inverted gold tripod with star cutouts serves as a holder for a 2-1/2" plastic softball, making this a unique trophy figure. Mounted to a round black plastic base with plenty of room to personalize, this is a trophy that will fit any budget.